We are an independent Christian Church. This means we have no denominational affiliation or headquarters. All decisions are made locally and Jesus Christ is the head of the Church. We have elders who are the shepherds, overseers, and protectors of the flock and deacons who are servers that have shown spiritual growth. The ministers and staff work with the elders to lead and pastor the Church. On October 15, 1825, seven men and thirteen women gathered near the southwest corner of Clark County, Kentucky. The result of this meeting was the formation of Mt. Zion Baptist Church. A large brick structure was constructed as evidence of the convictions of this group. It was located on what was later known as the Nelson Farm facing the Mt. Zion Dirt Road, now called Calloway - White Lane, and was deeded on May 27, 1827. Many of the most notable and gifted men of that generation preached at Mt. Zion, including Barton W. Stone, John Smith, Jacob Creath, E. L. Pinderton, David S. Burnet, Moses E. Lard, W. P. Clark and on February 3, 1850, Alexander Campbell preached the morning services. The ten year period between 1875-1885 was difficult for Mt. Zion. The main road became blocked making access to the church difficult for many members. 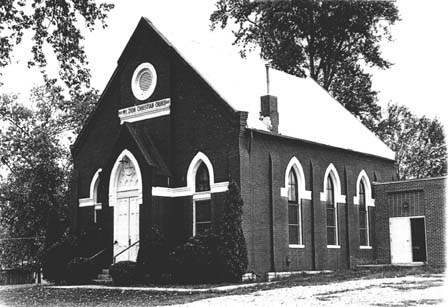 Therefore, using the original brick on a plot of ground donated by Mrs. Jenny Henderson Battaile and Mr. George Tebbs, the church was moved to its present location in Becknerville on Combs Ferry Road in 1883. Before the turn of the century, J. W. McGarvey, later the president of the college of the Bible at Lexington, was made the pastor of Mt. Zion. He preached until the close of 1903. It was during the stay of the next pastor, Kyle Brooks, that an organ was installed in the church on June 11, 1904. In 1975 the congregation voted to separate from the Christian Church (Disciples of Christ) and become an Independent Christian Church. Records indicate that from 1888 to date, there have been a total of 46 ministers beginning with I. B. Grubbs to Kenny Speakes, present minister since November 3, 1991. We believe Mt. Zion stands today as a rock through these ages due to the dedication of its past and pre-sent members, adoring the Father, seeking the Son and obeying the Holy Spirit. May her doors stay open that all may enter to worship and depart to serve. The new church building with a large sanctuary, offices, classrooms, kitchen, and gym was built alongside the old church building in 1998. The old church is now know as the "Chapel" and still hosts many weddings and other activities.